On our recent vacation to New Hampshire, I spent some time at Keepsake Quilting oogling and drooling over all the thousands of bolts of gorgeous fabrics. It seemed every bolt that I pulled out to get a closer look at had fabric designed by Sandy Gervais on it! I guess my Sandy Gervais radar was working at top speed! There is just something about her colors and her designs that I am very attracted to. Aren't they FUN? I love the dots with the circles around them. And I think the colors are just the thing for a baby quilt. 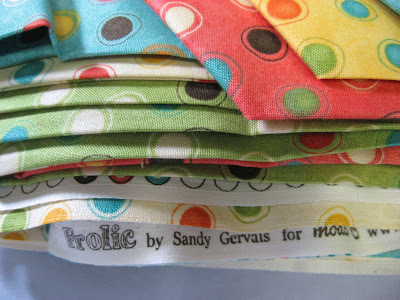 I love Sandy's Frolic line, but decided to stick with all the same design in the different colorways for this project. 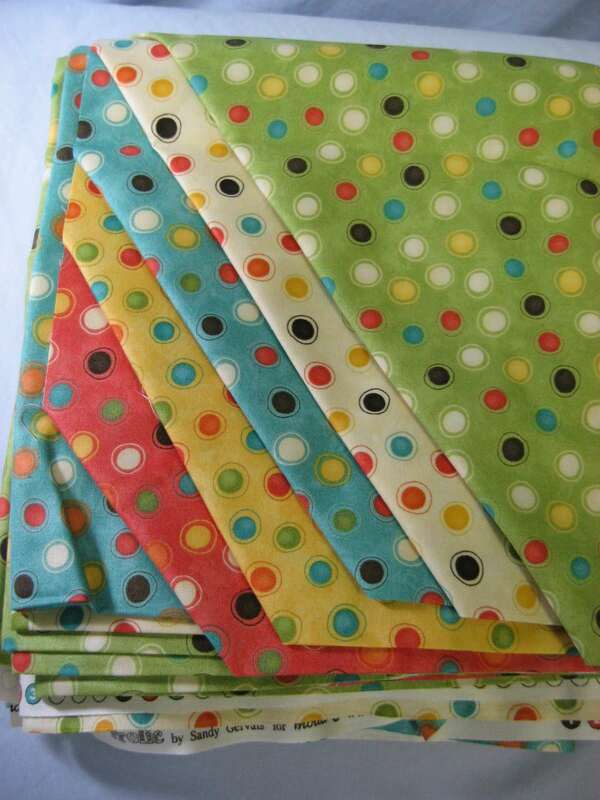 Don't you love how they cut and fold fabrics at Keepsake Quilting? These were all laid out on their cutting-mat-covered cutting table so that the appropriate cutting lines for each fabric were on top of each other, then one swish with the rotary cutter and all the fabrics were cut at once! 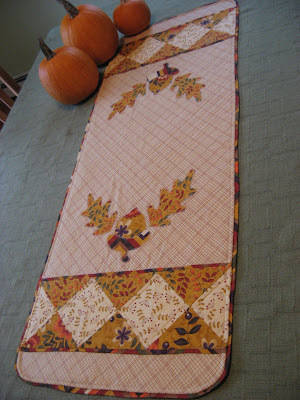 Then they fold them up together and tuck under the exposed corner to show off each fabric. I love it! Even Sandy's selvages are fun! I'll have lots from this project! 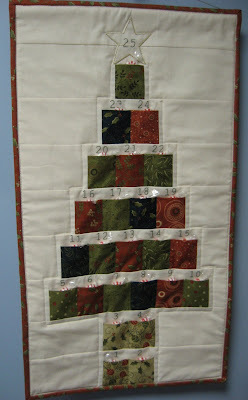 Today I cut the binding for this I Spy Quilt using this method which still never ceases to amaze me. I even measured my fabric before sewing the triangles together because I was convinced that little square of fabric could never produce enough 2 1/2 inch binding to go around this quilt. The numbers seemed to say it would work, but even after using this method so many times, I was still skeptical. I cut it anyway, and sure enough, ended up with way more yummy striped bias binding than I will need for this quilt! Amazing! If you haven't tried this method of making bias binding, you really need to. It's awesome! This week I'll be spending all day every day at cub scout camp with my seven year old son. This is his first time at scout camp, and mine too! We are both very excited about it. I think we'll come home exhausted and stinky, with lots of great adventures to talk about! Wish me luck though...I just might be getting too old for this sort of thing! 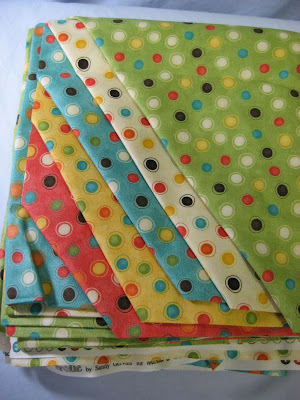 Great fabric for a baby quilt! Have fun at scout camp this week. I love, love, love those dots! You can never go wrong with spots! Great fabric - can't wait to see the finished product. Now I need to put my thinking cap on and figure out your binding directions!